We stated in earlier parts to this series that Laskhar-e-Taiba is a Takfiri, Khariji sect that was founded upon the ideas of al-Ikhwan al-Muslimeen and the ideas of Sayyid Qutb, Mohammad Qutb, Usamah Bin Laden and others who are from the generality of the 20th century Kharijites. Below we provide some evidence from their publications to show that these are indeed the people whom they guide themselves by and not the firmly-rooted people of knowledge who are manifestly upon the Sunnah. 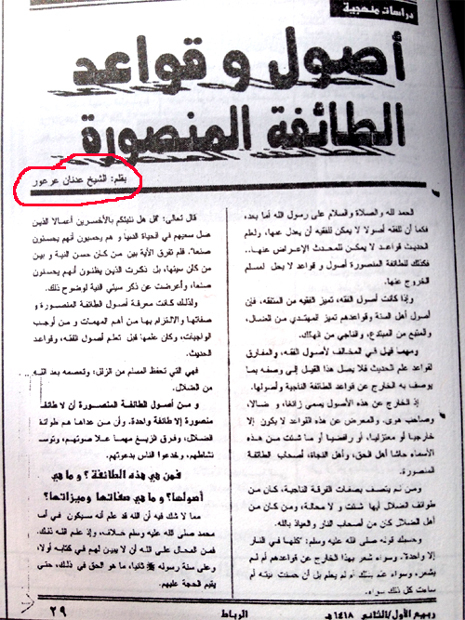 In the above two pages (from their magazine, al-Ribaat) we see articles by Sayyid Qutb and Adnaan Ar'oor. Sayyid Qutb's affair is well known (see SayyidQutb.Com) - an enemy of the Uncle of the Believers, Mu'awiyah (radiallaahu anhu) and the choicest of Companions such as al-Amr bin al-Aas, a misguided strayer who unleashed the malice inherent in the ideologies of athiest secular Jews ("social justice", "the wealth belongs to all") upon the choicest of Companions, and one who did not leave any major bid'ah except that he spoke of it, from the innovations of the Jahmiyyah, Hulooliyyah, Jabariyyah, Mu'tazilah, Ash'ariyyah, Rafidah and others. As for Adnaan Ar'oor, he is a fanatical blazing Qutbi, a caller to the manhaj of al-Ikhwan al-Muslimeen, and exaggeration in Tawhid al-Haakimiyyah upon the way of Sayyid Qutb the father of all 20th century Takfiri Khariji movements. He most recently disgraced himself by openly calling to wahdat al-adyaan. This is the end result of those who follow their desires and oppose the Messenger (sallallaahu alaihi wasallam), they are afflicted with a fitnah (24:63). Lashkar-e-Taiba guides itself by these types of people and their ideas. Because it is interested in rule and rulership and wrestling power from the authorities and mobilizing the masses to this end (even if it means winning material support from the Rafidah, Barelwiyyah and Deobandiyyah). Thus, a particular type of ideological nurturing is required in order to mobilize the masses against the authorities and of course, this is where the ideologies of Sayyid Qutb and those upon his way are of benefit. All of those who lust for power rely upon the works of this Baatinee Raafidee Khabeeth, Sayyid Qutb. This is why the Raafidah of Iraan translated his works in the 1970s in order to mobilize the revolution there. 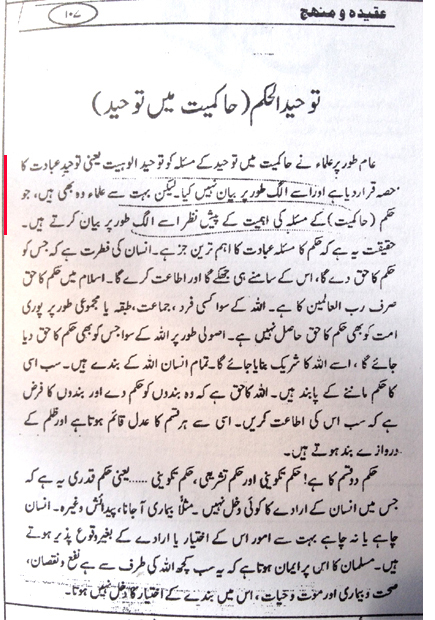 In the above two pages of the book of Haafidh Sa'eed (the leader of Lashkar-e-Taiba) we see him following the way of Qutb, Mawdudi, Adnan Ar'oor, Abdar-Rahman Abd al-Khaliq and other wandering strayers in making al-Haakimiyyah the most special meaning of "Laa ilaaha illallaaha" and making it appear as there is no shirk except shirk in Haakimiyyah and what is similar to the way of the 20th century Leninist Takfiris in ideologically justifying the practical manifestos of secular atheist Jews (revolution in the name of social justice) as the only means of bringing justice to the servant and the land. 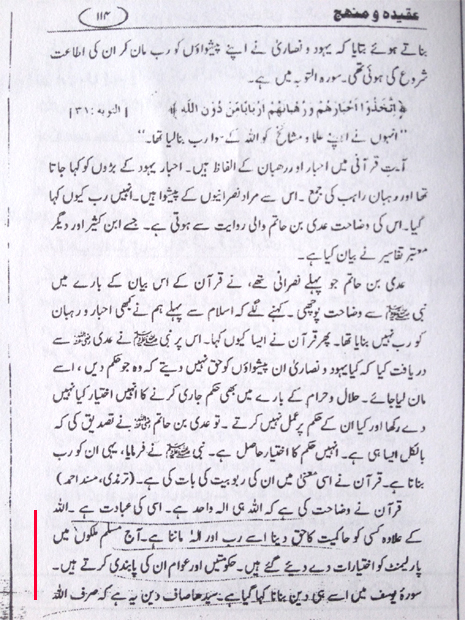 We read (bottom of p.114), "The Qur'an has made clear that Allaah is only one deity, to Him belongs worship. To give the right of Haakimiyyah to other than Allaah means taking him as a lord (rabb) and deity (ilah). Today, in Muslim countries, the choices have been given to the parliaments..." And this is elaborated upon over the next page. This is following the ways of the Qutbiyyah, Takfiriyyah in focusing upon rulers and governments and presenting Shirk as it if is only in the issues of judgement as it relates to the rights of men. As for the greatest shirk, the worship of graves and idols which the land is rampant with, then these people are not really interested in that except with a form of lip-service and except with an academic interest only (not one that is practical and comprehensive). Because otherwise the wealth and support they receive from the Barelwis, Rafidah and Deobandis (for their so-claimed version of Jihad) will not be so forthcoming. My brothers in this region, all Muslims be in preservation, O Pakistanis, Pakistan was founded upon a pure earth, however the affair is strange... the houses have no Islam in them, the markets have no Islam in them, there is no Islam on the face, the hand is not Muslim, the foot is not Muslim, the head is not Muslim, the courts are not Islamic, the general places are not Islamic, the police guards are not Muslim, and every person's mind has become non-Islamic, yet this (land) its name is Pakistan, Allaahu Akbar! 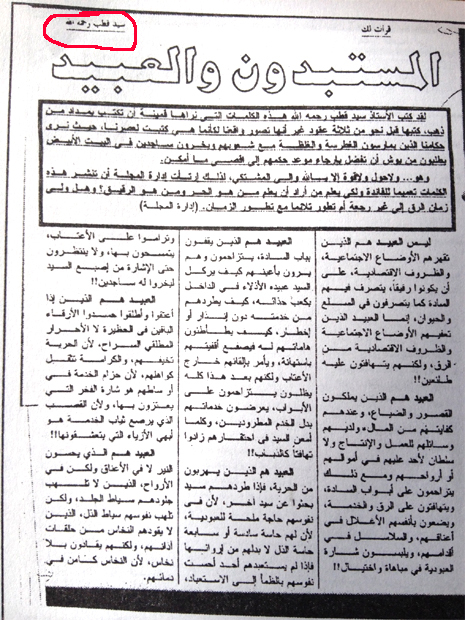 Admonition: As for their claim of calling to "Haakimiyyah" then let the ignoramuses know that the Sharee'ah was only removed and eroded and replaced with Secular Laws in those lands in which the people rejected the favour of Allaah by falling into worship of others besides Allaah, and thus, to take Egypt as an example, there are the graves of Dusuqi, Badawai, Sinjar, Zaynab and others, and Tawhid is related to amn (security) and Shirk is related to the opposite of that, so when they wronged themselves with Shirk, then that amn was removed, and from the removal of amn is the removal of those laws and rules in which there is justice, protection of life, property, honour and and maintenance of order, dignity and rights in the society. And you can say the same about India and other Muslim lands in which Shirk became prominent, and in which the Colonialists and Imperialists came and did what they did. And then you have the land of Tawhid which to this day walillaahil-hamd is established upon Tawhid and the Sunnah and in which the Sharee'ah law courts are present and established and in which, to this day, there is not found, the grave-worship and shirk found in other lands, and which is the reason why thus far, they enjoy relative ease and comfort, so long as they remain thankful for the favor of Allaah - without denying that there are indeed shortcomings. And certainly the Sufiyyah and Rafidah and other factions of innovators are present and working in their da'wah and it is the likes of these people and the Innovators in general that call to the rejection of the favors of Allaah (thank you Salman al-Banna al-Awdah, for calling for understanding with the Sufis and Shi'tes, what a faqeeh of the religion you are, it's people like you, through these activities of yours that are responsible for the hastening of the removal of Allaah's favors). So with what scales do the "Mufakkireen" judge? Nothing but the scales of Communist, Marxist, Socialist ideals of "social justice" which came from the likes of Dhul-Khuwaisarah at-Tamimi, and Abdullah bin Saba (al-Yahudi), and on account of which their figureheads (Qutb) reviled Uthmaan (radiallaahu anhu), praised the revolution against him and negated Islam from the Bani Umayyah, made Takfir of the entire Ummah and called for Leninist style revolutions of the type instigated ideologically and practically by Abdullah bin Saba against Uthmaan 1400 years earlier - all from the very same land of Egypt (see here)! 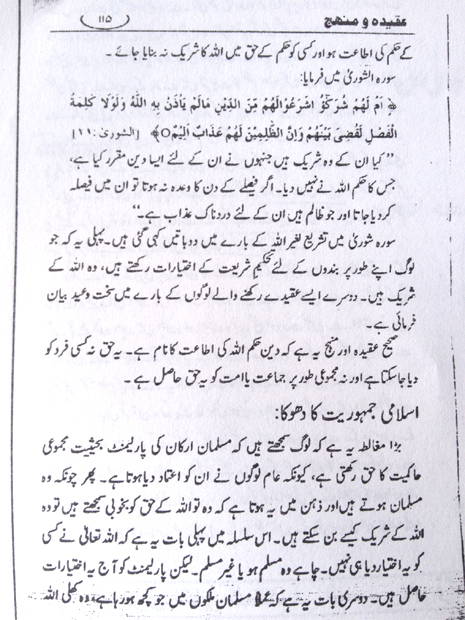 So we saw these 20th century ignoramuses come on the scene, compound ignorants, tainted with the secular ideologies of their times, compound ignorants of the law of Allaah with respect to His creation, compound ignorants of al-Qadaa wal-Qadar and its relation to the legislative command - wallowing in their Qadari I'tizali outlook in their intellects and in their ideology - driven towards such an ideology with notions of social justice they took from Communism and Socialism and methodologies built around manifestos of secular atheist Jews and the mass-populist, pluralistic philosophies of reform and rectification of 19th and 20th century philosophers - and these 20th century ignoramuses were involved in pursuing leadership, ideologically or practically, through non-Shar'iyy asbaab (ways and means) and those in Egypt were involved in coups and revolutions and all the types of intrigues that accompany the lust for power and leadership. And this is while they see all around themselves (in their lands) the worship of other than Allaah, supplication to other than Allaah, oaths for other than Allaah, hope in other than Allaah and so on, the very asl and very foundation of the Shirk that the Messengers were sent to prohibit - but they observed it and turned a blind eye to it, and made the social and communal rights of men with respect to each other, take a loftier position than the rights of Allaah over all the men - all in the name of their narrow, restricted, confined, and exaggerated doctrine of al-Haakimiyyah. Indicating their jahl of the Tawheed of the Messengers, and their jahl of al-khalq wal-amr. And when they tried to change the affair with their own hands (instead of through the legislated shar'iyy asbaab), indicating their Qadari I'tizali mental framework, then they were slapped down by Qadar itself, the Qadar that is tied to His legislative command and His hikmah, and all they got as recompense was one taghoot after another, and so neither the affairs of religion did they correct and nor the affairs of the world did they rectify - and so we see them today, in countries such as Egypt and elsewhere, clean shaven, trimmed, groomed, in suits and ties, participating in the parliaments and the likes to arrive at the "Haakimiyyah" of Allaah. Meanwhile, your average Egyptian continues to travel tens of miles, crossing rivers and streams, hills and mountains, to go to the graves of Dusuqi, Sinjar, Zaynab and the likes, so he can make tabarruk and supplicate to those in the graves to relieve his distress and repel his calamity. And then analogize this with all the countries in which this evil Qutbi-Bannawi fikr is behind the presence of hundreds of jamaa'aat all wasting their time in fruitless activities and perpetuating that vile, evil hizbiyyah that this fikr unleashed upon the Ummah. "So what the callers of al-Haakimiyyah do today, and they desire to make the Sharee'ah the reference point of judgment in the affairs of dispute pertaining to the rights (of the people), but do not judge to it in the affair of beliefs, and they say, "The people are free in their beliefs, it is sufficient that he says, 'I am a Muslim', whether he is a Raafidi, Jahmee, or Mu'tazilee", and so on, [and that], "We will unite on that which we agree upon and excuse each in that which we differ over", this is a principle that they have devised, and they call it "The Golden Principle", and it is in reality judging to the Book in some (affairs) and abandoning (judging to it) in that which is more important than (those affairs). [This is] because judging by the Sharee'ah in aqidah is greater than judging to it in the [other] affairs of the disputes pertaining to the rights (of the people). And thus, judging to it in the affair of aqidah, destroying the tombs, and the places of Shirk (shrines, tombs), and fighting the Mushriks until they believe in Allaah and His Messenger, this is more important." And Lashkar-e-Taiba is on the same path as those Ikhwanis of Egypt, essentially sidelining the greatest Shirk and presenting Tawhid al-Haakimiyyah as the greatest affair of the religion, and around which the bulk of their activity is actually based. This is the general manhaj and direction of the group.